Habboween is a Habbo-wide event that happens every Halloween. The event normally starts in early October and goes on until the start of November. During the Habboween festivities, furniture and promotions are released to entice the Habbo players. As Habboween is one of the most important and popular seasons on the game, Habbo release many new furni ranges (usually corresponding to horror); such as Gothic and Voodoo each year. This is usually accompanied by the re-release of the Halloween range each year, often with a few updates or extra items added. Different competitions are run each year, and a spooky tale is usually unfolded. Many games and competitions were released, and Sulake re-released Habboween furniture, downloads and e-cards. Players centred the chance to choose their own rare, by picking an old one to be resurrected. There was a Pumpkin Design competition again, and as a new addition to the Habboween events, the Habbo Clans. What players had to do was form a group, whether it was friends or a stranger, then had to take part in various tasks and one clan would be the winner, publishing their article in the newsletter. There were also several secret quests, featuring the mysterious Resistance. Habboween 2006 centred around a game of code-cracking, where players had to check the Rares page in the catalogue each day to find out the time that the secret 'Serpent of Doom' would be released. The secret rare was the Black Dragon Lamp. The Alien Artifact #1337 (now renamed as HB Zero-300) was also released into the catalogue. There were also room building competitions, graphics competitions and quests, which earned players badges for completing or winning. A cauldron was added to the Halloween range. The Habboween Theatredrome was brought back, along with the Halloween range. However, there were a few additions to the Habboween collection this year, such as the Crypt and Grave. There was also the traditional Pumpkin Design competition, along with an Alteration competition. 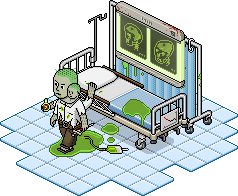 Habboween was very different this year - the story centered around a deadly virus spreading through the hotel uncontrollably. There were many competitions, such as hospital building, which was aided with the addition of the new furniture which was released in the catalogue and is now known as Virus furniture. A few days after the virus began, Lost_Witness and Bucho6 were both 'struck down'. At this stage, more furniture was added to the catalogue for the hospitals. The message from Sulake HQ was as follows: Your Hotel Managers are entering the final stages of the virus and need YOU to fight back and save them! 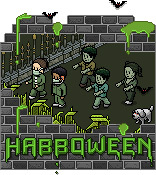 For Habboween in 2009, Habbo went with a Haunted Hotel theme. Users had to share videos, photos or stories about their scary experiences on Habbo, and each story, video or image was rewarded with a badge and (normally) the October collectable which was a Ghostly Organ. Habbo also held a number of quests and comps, each different for each hotel. Habboween 2010 brought another new range of furniture - Voodoo. As well as the re-release of Halloween furniture (yet again), the Voodoo range was introduced as a way of increasing the Halloween range without making the catalogue page too large. Players were given the opportunity to quest through rooms themed in this way, following clues to get to the final room and receive a badge. The Pumpkin Design competition was also revived. For Habboween 2011, a storyline was made about an evil demon named 'ChronoZomfg' who was attacking the hotel. Players could go to 'The Hellbound Lounge' and decide to join one of 3 teams to battle ChronoZomfg. When a player joined a team, they would be given a badge for that team, and members of the winning team ('The Serpents of Doom') received an extra badge. Several different pixel effects, based on horror characters (such as bandages, knives and a Hellraiser hat), were available to buy, as well as a furniture statue called 'Hell Hound'. The Haunted Carnival range introduced carnival themed furniture. Highlights included the first new roller since 2009, the Costume Gate and Costume Hopper which only allowed Habbos wearing costumes to enter, and the new Pumpkins currency which was required to buy all furniture. Frightful Furni was a more traditional Halloween range based around fairy-tales. It brought the Demonic Sheep Limited Edition Rare. Day Of The Dead was based on the Mexican holiday and introduced over 40 colourful items. Habbocalypse featured apocalypse themed items. It included four Limited Edition Rares based on the Four Horsemen of the Apocalypse, Death, Pestilence, War and Famine. It also introduced the Crafting system for the first time, and all users received a pre-made room to help them craft. The Ghost Hunter campaign featured an Evil Frank who was working with the Grim Reaper. Slimey Ghosts were hidden in the Public Rooms and gave purification essence to use to purify the haunted furniture. Cursed Caves was based on the haunted caves underneath Habbo. New armour was introduced in the crackable Flaming Knight and the Hellfire Dragon Limited Edition Rare was introduced. The Habboween campaign and furni range for 2018 was Infected Laboratory. It centred around shady government experiments and colliding dimensions. This page was last edited on 8 October 2018, at 05:22.